I was going to do the clipboard thing this year too, it's a great idea. I love your school room! would you be up to doing a clipboard tutorial for me? I would love to do these with my class this year! 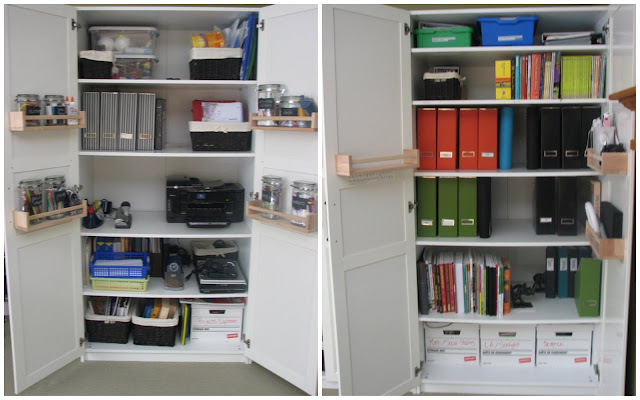 I LOVE being organized but haven't actually gotten to that point in any home we've been in. Maybe the one we just bought will be big enough for everything to have a place. The Container Store has become my new favourite hangout, although I should take a walk through Ikea too. Your school room has inspired me. Awesome organization Karina!!!! you're an amazing mom and teacher! Very fun and impressive and if I wasn't lazy and tired, I'd say......inspiring! Your organization puts me to shame! I always have visions of order and neatness...but never real pictures. I'm impressed. I hope your schooling year goes well. Yahoo for de-clutterizationness! Great work- it looks very inspiring and motivational... Maybe seeing yours will rub off on my house. Who knows? To all my dear friends - You are all hilarious - I hope you understand how I need these huge systems to compensate for my huge weaknesses in the mess-making department! Laura - I'll try and do a clipboard tutorial - they are super easy, and you can find clipboards at the dollar store - Yay! Beth - I've been thinking about you a lot, setting up your new home. I hope you enjoy every minute, and don't rush too quickly to buy containers - it's taken me two years of homeschooling in this house to feel good about a system for our things!!! Wow - this comment is almost another blog post! i would homeschool in a heartbeat if it meant i could have a room like that with those spice racks and all. totally jealous!!! !